Borderpanes may be styled with backgrounds and borders using CSS. See Region superclass for details. 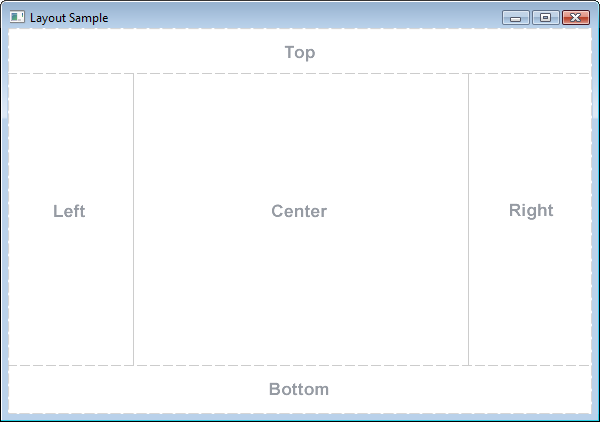 See "Optional Layout Constraints" on how to customize these alignments. BorderPane lays out each child set in the five positions regardless of the child's visible property value; unmanaged children are ignored. BorderPane is commonly used as the root of a Scene, in which case its size will track the size of the scene. If the scene or stage size has not been directly set by the application, the scene size will be initialized to the border pane's preferred size. However, if a border pane has a parent other than the scene, that parent will resize the border pane within the border pane's resizable range during layout. By default the border pane computes this range based on its content as outlined in the table below. A border pane's unbounded maximum width and height are an indication to the parent that it may be resized beyond its preferred size to fill whatever space is assigned to it. BorderPane does not clip its content by default, so it is possible that childrens' bounds may extend outside its own bounds if a child's min size prevents it from being fit within it space. An application may set constraints on individual children to customize BorderPane's layout. For each constraint, BorderPane provides a static method for setting it on the child. alignment javafx.geometry.Pos The alignment of the child within its area of the border pane. The node placed on the bottom edge of this border pane. The node placed in the center of this border pane. The node placed on the left edge of this border pane. The node placed on the right edge of this border pane. The node placed on the top edge of this border pane. Creates an BorderPane layout with the given Node as the center of the BorderPane. Creates an BorderPane layout with the given Nodes to use for each of the main layout areas of the Border Pane. Removes all border pane constraints from the child node. Gets the value of the property bottom. Gets the value of the property center. Gets the value of the property left. Gets the value of the property right. Gets the value of the property top. Sets the alignment for the child when contained by a border pane. Sets the value of the property bottom. Sets the value of the property center. Sets the value of the property left. Sets the margin for the child when contained by a border pane. Sets the value of the property right. Sets the value of the property top. The node placed in the center of this border pane. If resizable, it will be resized fill the center of the border pane between the top, bottom, left, and right nodes. If the node cannot be resized to fill the center space (it's not resizable or its max size prevents it) then it will be center aligned unless the child's alignment constraint has been set. The node placed on the top edge of this border pane. If resizable, it will be resized to its preferred height and it's width will span the width of the border pane. If the node cannot be resized to fill the top space (it's not resizable or its max size prevents it) then it will be aligned top-left within the space unless the child's alignment constraint has been set. The node placed on the bottom edge of this border pane. If resizable, it will be resized to its preferred height and it's width will span the width of the border pane. If the node cannot be resized to fill the bottom space (it's not resizable or its max size prevents it) then it will be aligned bottom-left within the space unless the child's alignment constraint has been set. The node placed on the left edge of this border pane. If resizable, it will be resized to its preferred width and it's height will span the height of the border pane between the top and bottom nodes. If the node cannot be resized to fill the left space (it's not resizable or its max size prevents it) then it will be aligned top-left within the space unless the child's alignment constraint has been set. The node placed on the right edge of this border pane. If resizable, it will be resized to its preferred width and it's height will span the height of the border pane between the top and bottom nodes. If the node cannot be resized to fill the right space (it's not resizable or its max size prevents it) then it will be aligned top-right within the space unless the child's alignment constraint has been set. center - The node to set as the center of the BorderPane. Creates an BorderPane layout with the given Nodes to use for each of the main layout areas of the Border Pane. The top, right, bottom, and left nodes are listed in clockwise order. top - The node to set as the top of the BorderPane. right - The node to set as the right of the BorderPane. bottom - The node to set as the bottom of the BorderPane. left - The node to set as the left of the BorderPane. Sets the alignment for the child when contained by a border pane. If set, will override the border pane's default alignment for the child's position. Setting the value to null will remove the constraint. Sets the margin for the child when contained by a border pane. If set, the border pane will lay it out with the margin space around it. Setting the value to null will remove the constraint. null unless the center, right, bottom, left or top has a content bias.